The latest edition of Kingpins Amsterdam, held last Wednesday and Thursday, was another hit. Record crowds on both days and a record number of exhibitors (101) made the show being a must-see for denim industry insiders. Many events happening at the end of the first day such as Tavex-Evlox change of name announcement, Candiani Denim’s 80th anniversary and Orta denim’s 65th anniversary confirmed how many insiders chose to celebrate their most special announcements within Kingpins. Beyond a vast offer of denim, accessory and fiber manufacturers, as well as garment producers from all over the world, the show hosted several new chemical companies, laundries and activists. 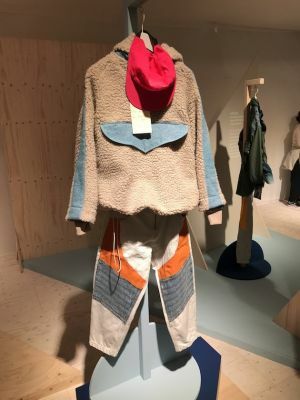 The main focus for almost each manufacturer participating was sustainability and eco-friendliness either by launching new fabrics made by blending post-consumer recycled garments or employing less polluting technology that can help cut water, energy and chemical use and reduce CO2 emissions. Amping up the theme were Artistic Fabric Mills Garment Industries, Artistic Milliners, Berto, Bossa, Calik, Candiani Denim, Cone Denim, Denim Expert, Desert Studio, Lycra, Metalbottoni, Tejidos Royo, Tavex-Evlox, Tencel and many others. Among the companies making their debut at the show were Neela Denim, a denim manufacturer born two years ago from Sapphire Fibres, part of Sapphire multinational group. Its offer of fabrics is wide and highly innovative as the textiles employ forward-thinking fibers. Chemical specialist Rudolph Group also debuted by launching its new Hub 1922 project aimed at supporting jeanswear industry insiders with new chemical solutions that add higher performance to denim and casual fabrics. Among its newest products there is Memoflex, a finish that improves the quality of stretch fabrics by preventing their loss of shape. Another new exhibitor was Elleti, an Italian laundry and garment manufacturer that also acquired Martelli Lavorazioni Tessili. It presented a series of faithful reproductions of historical Levi’s vintage denim pieces dating between 1900 and 1930. Also debuting was Evlox, Tavex’s newly launched company brand name. Label manufacturer Panama Trimmings launched two new concepts for labels–Viridis and G-Label. Viridis labels are made with new animal-free leathers obtained from vegetal polyoils. G-Labels labels are made by 3D printing of a special ink made by employing recycled graphite. Among the new trends Calik supports is a return to the ’90s with a rediscovery of the skating attitude of baggy silhouette jeans for men but also furry effect and soft touch denims for women. Color denim is another must of the season at Calik and Bossa with garment dyeing treatments such as bright yellow and brick red for the first one and dusty pink and pale purple for the second one. Bulky though lightweight fabrics are also new musts at Orta Denim. Berto launched a collection entirely inspired by Roald Amundsen’s North Pole travel explorations. Its offer includes earth and dark green tundra colors as well as white shades often brightened by lurex elements, though also micro and macro-checks, and wool-cotton rustic surface fabrics. Japanese manufacturer Shin Denim presented a series of new employs for its denims guaranteed not to fade after extended use. Thanks to this difference its fabrics can be used for school and college uniforms, wallpaper, car interiors, furniture coverings and for tatami flooring. Cone Denim is launching a new series of denims made with silk (between 6% and 10%), and an eco-friendly variant of S-Gene fabrics. These denims employ special yarns whose inner core is made with recycled PET then covered with cotton fibers. Artistic Milliners has developed Frenchie, a new series of urban-chic though casual-cool fabrics. This series of fabrics originates from a collaboration with longtime fashion insider and denim expert Tilmann Wröbe, a.k.a. Monsieur-T. These fabrics are characterized by a mix and match of shiny and matte surface aspects perfect for slim jeans for women, versatile blazers, shorts and trench coats but also for men’s smart low-crotch denims. Artistic Milliners also presented The Super Charged Noir, a special non- fade black denim that is sturdy though soft touch as it is made with Cordura and Tencel technologies, and a new Invista’s staple nylon 6.6 Black DSN fiber innovation. Tejidos Royo launched its newest Dry Indigo technology. Thanks to it the denim industry will no longer need large infrastructures. This new indigo dyeing process is no longer be a water intensive process as – differently from usually – yarns can be dyed in less than 20 meters industrial productive units. Such new technology will allow more flexibility for customers, as well as energy, cost, water and productive space saving. Pizzarro, a Portuguese laundry, has announced the foundation of Pizarro Wiser, and its joint venture with Wiser group. The new organization is based in Amsterdam, for design and sales, and Guimares, for production, and offers full package Made in Portugal denim production. Jeanologia announced a whole new technology program through which the industry can be freed from the employ of potassium permanganate thanks to its whole series of technology and EIM software through which brands can communicate their progress in reducing water and chemical use and CO2 emissions.